On your mark... Get set... STOP! Wait, why did some of you start running? Boy, I hope you haven't been waiting until now to start -- and if so, I wish you the best of luck, because the New Toon Laff-o-lympics ends TODAY! 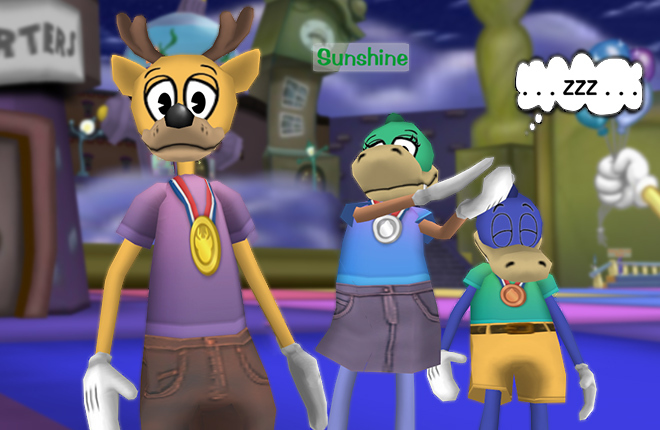 Deer and Crocodile Toons of all shapes, sizes, puns, and personalities have been competing in the most competitive Toontown event to date, the New Toon Laff-o-lympics. These Laffletes have put countless hours into training to reach a high Laff, and today it all pays off! In case you've forgotten, here are the prizes for each milestone of the Laff-o-lympics. And for the first time ever, the bronze, silver, and gold medal shirts have been debuted in the image above! 50 Laff - Receive a bronze medal shirt and a "New Toon Starter Pack" full of jellybeans and ToonFest tokens! 100 Laff - Receive a silver medal shirt and an exclusive SpeedChat phrase to show your glory! 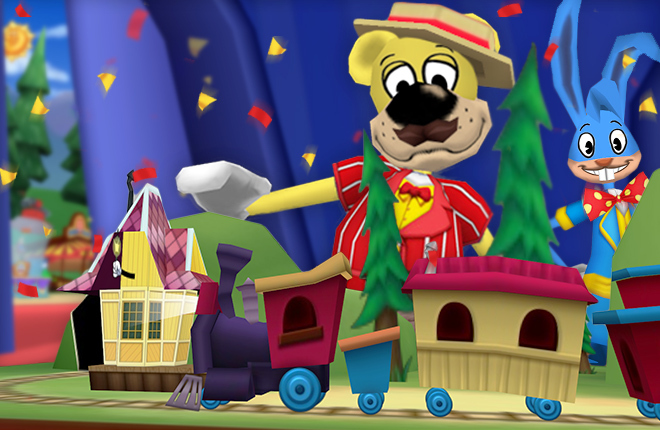 115 Laff - Receive a gold medal shirt, and enter a drawing to win one of three real-world Toontown prize packs with a Toontown poster, drawstring bag, and trading cards! ONE grand prize winner of the drawing will receive a Toontown poster signed by members of the Toontown team. Each milestone will receive the previous milestone's rewards in addition to the listed prizes. The medal shirt rewards are not the same as the gold medal shirt given during January's Top Toons contest. 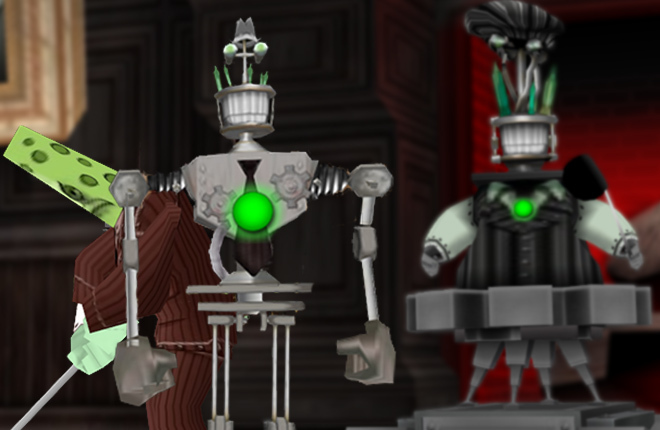 After the event ends at 11:59 Toontown Time (PST) tonight, the Toon Council will spend a short amount of time reviewing the winners and making sure there was no cheating along the way. Once we get everything squared away, we'll be sending out the prizes and announcing the gold winners on the blog! Don't worry - it won't take long. 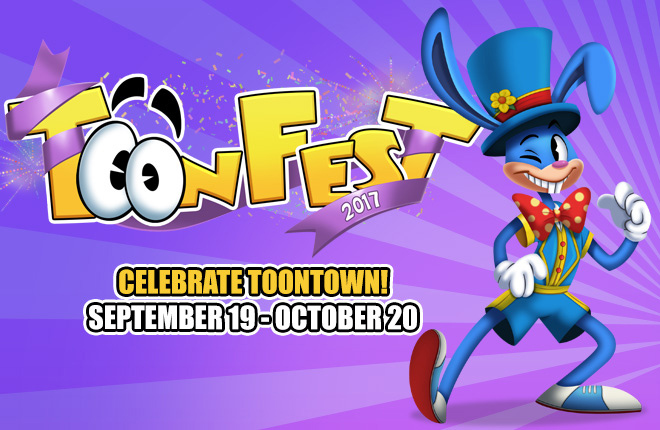 We know that you want to get your hands on those ToonFest tokens before ToonFest ends. Finish strong, Laffletes! You can do this! i got to level 54. i may not have gotten to gold but i'm happy that i got this far with my limited time of play. good job every toon who did there best and had fun! Keep pushing to your next goal Laffletes! Great post and even better event. Was a blast to be apart of it and reach that 115 goal. I wish I could’ve played more but with school and Irma it killed my play time. Congrats to those who got past The Brrgh!! I only got to 50, but I'm happy! The laff-o-lympics was a lot of fun! Unfortunately, school work was pulling my leg so I was only able to reach 50 laff. I've made it to 100 laff tonight with my pal, Orange Yu Glad, hitting 52! It's no 115, but considering what small amount of time I've had, this is the quickest I've ever gotten a toon this far in this amount of time! I'm glad to have been a part of this path! I was trying to get my croc toon to 50 laff, but she's only at 25 laff and I've been working on maxing cashbot on my main toon. Oh well. But congrats to the other toons that have been working very hard on getting their toons to 50, 100, or even 115 laff! Just finished my last CFO and reached 115!! So excited! TTR team, I love you guys! I want you to know I laughed so hard at "(I'm looking at you too, parents!)" Hahahahaaa they are speaking to me! got to 102 laff, not the highest but did my best. Fastest I've ever leveled a toon in my life. Nice Job everyone!! I'll be exited to see how many people made it to each milestone! I tried, but with the limited time I couldn't meet my goal. I got to 92 though. And I didn't get there with any help from another higher toon of mine! I'm feeling proud of that! Made awesome friends! Hope they did well! Going to go have fun in Toonfest! I'm finishing in silver at 100 laff and I'm good, don't need a gold shirt, silver looks fine. was a lot of fun. Just made it to 100 tonight! Made it to 115 and 101 six days ago!!! 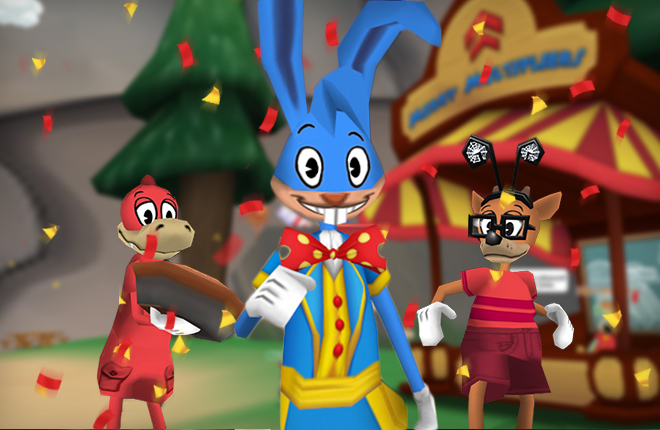 Congrats everyone and thank you TTR Team! im glad i hit 104 at the end of last month. this thing really encouraged me to train a 2nd toon. My deer managed to hit 115 and I'm super hyped to see the gold medal shirt in-game! Congrats to everyone who got a medal, whether it's bronze or gold it's still a big accomplishment! Good luck in this final day everyone, and congrats to all who will receive a prize!!!! Wish I did this laff-olympics now that we talk about it but, I am very happy for my friends and all of those who won the olympics or won a medal. Hope you guys are very happy with your run and had a very toontastic time doing it because whats toon town without it being toontastic? Thank you so Much TTR! !, it has been such a fun event!!. :D hope they will be more events in the future!!. Sadly, real-world obligations kept me from getting any higher than bronze, but I look forward to seeing all the silver and gold medalists! Thanks bunches! Sure was fun to participate! Loving the events! You guys do great things to keep our Toon spirits up! Aw man! Can't believe i missed out with my gator toon. Me and my croc buddy made it past 50. We can't wait to see what we get. Thank you for being so generous, yet again. It was a fun challenge! I made it to 50 laff at least Good job to everyone who got all rewards! Congratulations to all! I was one of the few soundless deer/croc whom made it to 115 :-) I hope to see more! Congrats to everyone who made it! Good job! Alas, I didn't enter this year. But I probably couldn't have made it if I tried XD. Congratulations, Laffletes! The Olympians have nothing on you! Glad I made it to 115 on the last day! Hope I get the poster :P good luck to everyone else! I made it to 110 laff. Tried to get 115 laff. I didn't think I'll get there by the end of the event, but I'll make it to 115 after the Laff-O-Lympics. Welp. I didn't even get 50 laff. Congrats to everyone who did though! I made it to 115, congratulations to all the toons that made it to 50, 100, and 115! Schoolwork got in the way, but I managed to get my deer to 50 laff during my free time. I really enjoyed this event! Needed the reminder about the importance of school during this haha! Congrats to all the winners ! !